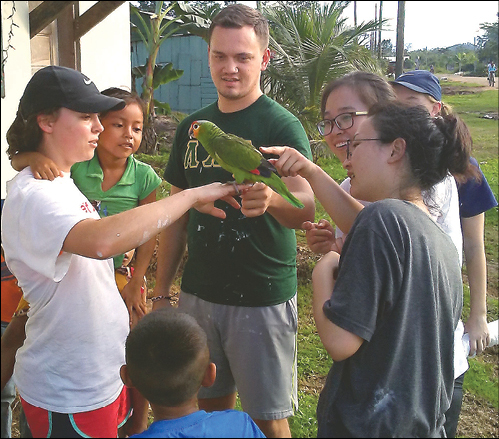 The third mission trip to Belize was the largest yet for Oklahoma City University students and faculty traveling there during OCU’s Winter Break with Charles Neff, vice-president for University-Church Relations. For the inaugural trip, in 2015, there were seven people on the OCU Mission Team. Fifteen participated in 2016. This January, a total of 27 made the 2,000-mile journey to the Central American country. "This year we brought two teams — a construction team and a community health team," said Rev. Dr. Neff. The construction team prepared and primed classrooms on the second floor of the Belmopan Methodist High School and mixed and hauled concrete by hand to pour a new sidewalk and floor at a nearby primary school. The community health team, students and faculty members from the OCU Kramer School of Nursing, worked closely with the Ministry of Health to provide health fairs in two rural villages. "My time in Belize has forever changed my view and sparked an interest in public health for me," said Keith Blair, a member of the nursing team. "I will forever think back on my times there and hope to visit again once I become an RN to better help the community in whatever way I possibly can." During their weeklong mission, the OCU teams also visited Marla’s House of Hope, a residential home for girls. The Oklahomans helped the girls with homework, played volleyball, and exchanged stories about life in their respective countries. They also purchased and distributed rice, beans, and flour in some of the poorest neighborhoods in the capital. Due to a pair of generous grants from the United Methodist Woodworth Estate, trip cost was minimal for the students. OCU is looking ahead to a domestic mission trip to Denver during Spring Break in March, a construction trip to the Bahamas in May, and a fourth trip to Belize next January. OCU students Madison Snow, Stephen Lashley, Xiaoxiao Hu, Aurora Cao, and Casey Kurry make new friends while distributing beans, rice, and flour in the village of Mayapan.